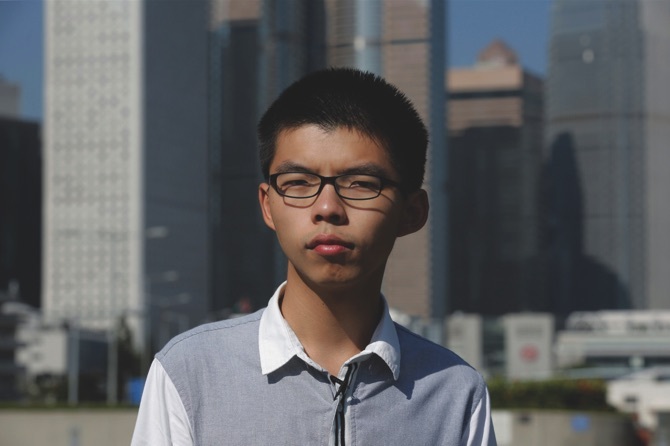 Young Hong Kong democracy activist Joshua Wong warned yesterday that China’s rise means human rights are in increasingly greater danger of being overshadowed globally by business interests. He was responding to questions about his expectations for an upcoming Asian tour by President Donald Trump, who will visit China and four other countries. The 21-year-old, Hong Kong’s most famous activist, is out on bail while he appeals a prison sentence related to his involvement in massive 2014 pro-democracy protests. Beijing promised to let Hong Kong maintain wide autonomy and civil liberties after its 1997 handover from Britain under the “one country, two systems” blueprint, but pro-democracy activists and lawmakers fear that China’s communist rulers are reneging on their promises. The China model is a reference to economic development without corresponding democratic reforms as well as the name of a controversial booklet praising China’s one-party rule the Hong Kong government planned to distribute in 2012 to schools as part of “moral and national education.” Wong helped lead protests forcing the government to shelve those plans. Wong was given bail last week, two months into a six-month prison sentence. He and a fellow activist, Nathan Law, were both sent to prison after the justice secretary won a legal challenge overturning more lenient sentences. The move sparked fears Hong Kong’s independent judiciary was under threat. They’re due in court Nov. 7 to appeal the sentences. During his time behind bars, Wong had to do compulsory marching exercises 30 minutes a day and ate with a spoon because forks, knives and chopsticks are banned. Not being allowed a phone he couldn’t update his popular social media accounts but Wong said being unplugged allowed him the opportunity for “spiritual reflection.” Prison news was limited to Hong Kong’s pro-Beijing publications, but he read books such as “I Am Malala,” by 20-year old Pakistani activist Malala Yousafzai. Wong plans to keep fighting for full democracy in Hong Kong. In the short term, he said his political party, Demosisto, will announce a candidate as early as next week to run in a by-election next year for the city’s semi-democratic legislature to fill a seat vacated when Law was disqualified because of a government legal challenge.